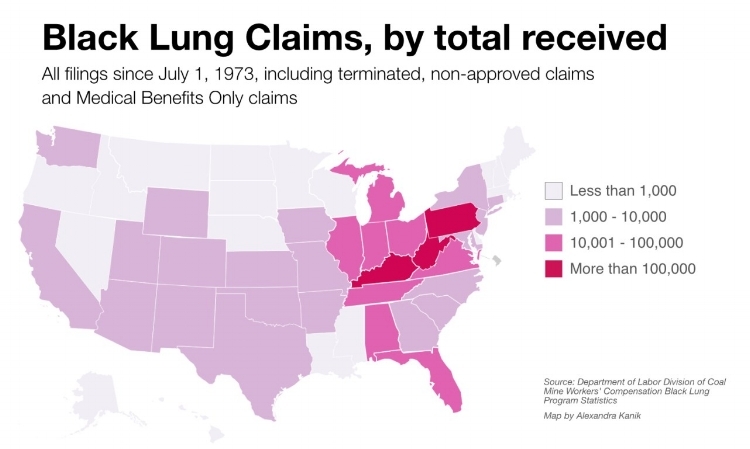 Rates of Black Lung disease are on the rise in coal communities across Appalachia, but Congress is set to allow Black Lung Disability benefits to be jeopardized. Congress has failed to pass an extension of current funding levels, but some members are fervently working to pass this extension as part of an appropriations bill up for a vote on December 21st. Congress must act to protect miners and pass an extension of the Black Lung Excise Tax. Write a letter to your members of Congress today telling them to pass an extension of the Black Lung Excise Tax before the holidays. Black Lung, or pneumoconiosis, is caused by inhaling hazardous coal dust. Companies that operate today pay for benefits for miners who suffer from Black Lung, but, when coal companies file for bankruptcy, miners are left without funds to cover the treatment for this horrible disease. The Black Lung Disability Trust Fund was designed to fill that gap: it places a small tax on each ton of coal produced, and that money is used to help struggling miners. However, in 2017 alone, more than 2,500 claims were transferred to the Trust Fund due to coal company bankruptcies. This important Trust Fund has been struggling to remain solvent as more people need assistance due to rising rates of Black Lung - and the situation is about to get worse in 2019 when the tax rate is scheduled to fall unless Congress acts now. The Trust Fund has run at a horrible deficit since its inception and having the rates coal companies pay into the Trust Fund lowered will only drive this deficit up even higher and will continue to be a burden on taxpayers. Coal companies should be paying more into this Trust Fund, not less. It is their work environments that can cause this disease, and more often than not, when a Coal Company goes bankrupt it will simply change its name and go back to mining operations under a different company name. Coal companies, as a whole, would save roughly 3 million dollars a week if this bill extension does not happen. That is 3 million more dollars a week that taxpayers would have to endure on behalf of the coal industry. Please send a letter telling your members of Congress to pass an extension of the Black Lung Excise Tax with the appropriations bill before the holidays.